Fujifilm's Instax line of instant cameras have been around for a while. The ability to take a photo and get it printed instantly has universal appeal, even though the image quality might not always be up to the mark. That's because instant cameras don't usually have the best optics, so the final printed result is often underwhelming. This is where pocket printers come in. These devices, like the HP Sprocket we reviewed a while back, allow you to print photos taken by your smartphone, which should usually give you sharper prints with better colours and details than an instant camera. 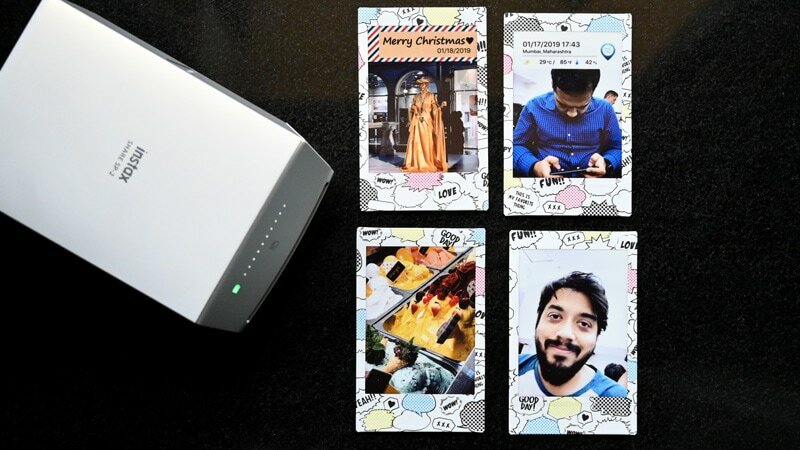 Fujifilm launched something similar in India around November last year, called the Instax Share SP-2 smartphone printer. It's essentially an Instax camera, but without the camera bit. The SP-2 connects to your phone over Wi-Fi for printing photos on instant film. So is it any good? Let's find out. 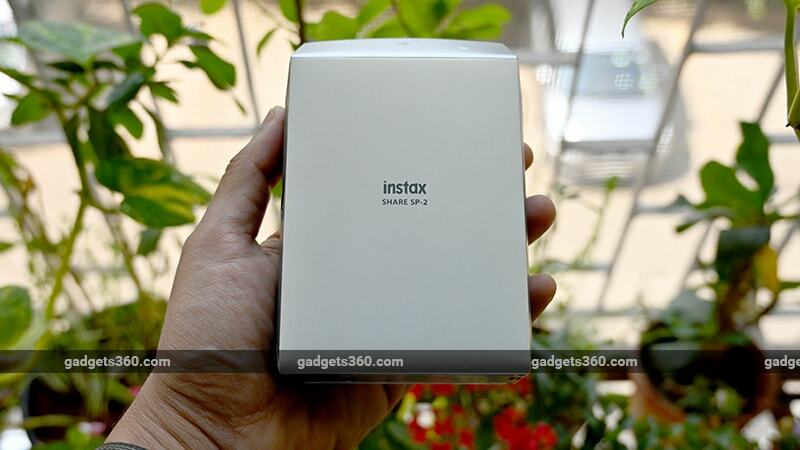 The Instax Share SP-2 weighs about 250g and is small enough to easily be carried around. It's a little bulkier than some of the other instant printers we've seen, so fitting it in your pocket isn't going to be easy. The off-white, grey, and silver colour scheme that Fujifilm has chosen, unfortunately, looks quite boring and reminded us of old floppy disks/ CD-ROM drives from yesteryear. There's a gold-trimmed version available too but it doesn't help with the aesthetics too much. At the front, we have a battery-shaped LED which glows green when the battery level is more than 50 percent and red when it's below that. It flashes red when there's no charge left. There's also a row of 10 LED dots that pulsate when a photo is printing and also shows you the number of remaining films in the cartridge. In our experience, we didn't always find this to be very accurate. On one occasion, it kept showing us that there were three films left, when the cartridge was actually empty. The Instax Share SP-2 has two buttons on the side, one for power and one for reprinting the last photo. The latter is quite handy if you need to quickly print multiple copies of a picture. The Micro-USB port is covered by a flap and is used to charge the printer. The Lithium-ion battery is actually removable, which is nice. 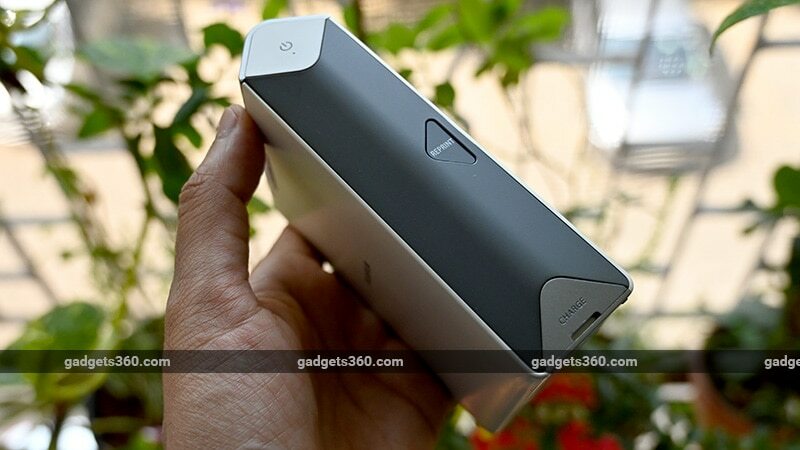 This is the same battery that's used in many of Fujifilm's point-and-shoot cameras. The printer uses Instax Mini film cartridges, the same one used by the Instax Mini 9, which lets you print 62mm x 46mm, credit card-sized photographs. Each cartridge can hold a maximum of 10 instant films. Unlike zero-ink printing paper like the ones from ZINK that are used with devices such as the HP Sprocket, film cartridges are larger, which is another reason that the Instax Share SP-2 is a bit bulky. The printer supports instant film cartridges of up to 800x600-dot resolution, and compatible image formats include JPEG and PNG. It connects to your phone using Wi-Fi 802.11b/g. The Instax Share SP-2 features a new laser exposure system that boasts of a printing time of 10 seconds. This time is calculated from the moment you give the print command to when the film is ejected. You'll still have to wait for a few minutes for the final result to fully develop. 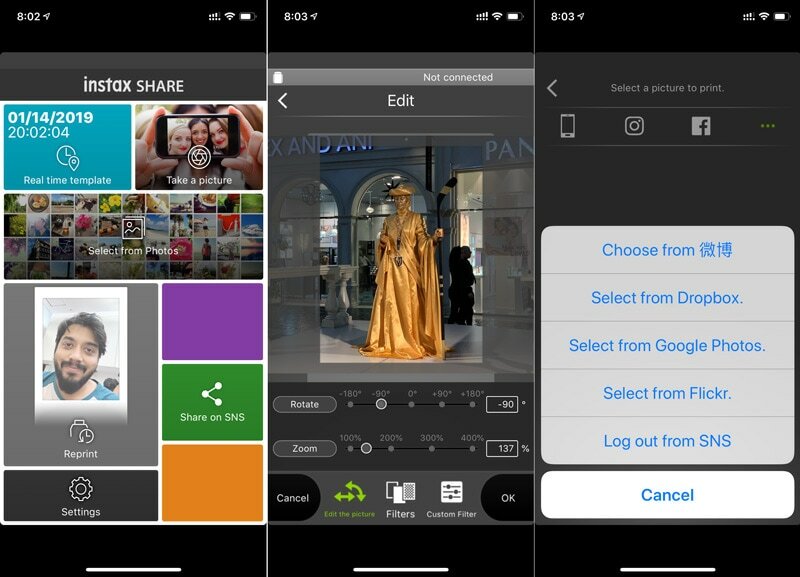 In order to start printing, you'll need the ‘instax SHARE' app on you Android or iOS device. The printer can also be paired directly with most of Fujifilm's recent cameras, such as the X-T3, for directly printing photos straight from the camera. With the printer on, you'll need to first connect to its Wi-Fi SSID in your phone's settings, after which the app will recognise it. It's pretty simple and straightforward to use from there on. You can print a photo that you've just taken or add a ‘Real time template,' which overlays the current date, time, location, and weather conditions on your image. The advantage of an instant printer compared to an instant camera is that you can also print any of the older photos you have on your device. The app lets you pick photos from your gallery, or you can print directly from services such as Instagram, Facebook, Dropbox, Google Photos, and Flickr. Before printing, the app lets you customise a photo. You can add a seasonal template like a birthday or Christmas theme, add text, and even edit you image, resize it, apply colour filters, or manually adjust the brightness, contrast, and saturation. You can also create a collage of up to four photos.. You can add text too, but freehand drawing isn't supported so you'll need to create that separately before importing it in the Fujifilm app. The Instax Share SP-2 makes a whirring noise while the photo is slowly ejected from the front. It's not very loud but it's audible. Image quality is quite good, even by regular standards. Compared to the instant cameras that we've reviewed so far, which use the same film, the results are much better. Even without any tweaking, the photos we printed had very good detail and colours were punchy and vibrant. Remember, you need to give the film a couple of minutes to develop properly, so be patient. Fujifilm sent us a couple of packs of the ‘comic' edition of its instant film, which has some comic-style graphics around the borders of each frame. Instant film has a nice retro feel, similar to classic Polaroid-style photographs. Unlike ZINK paper though, you can't print without borderless or use your photos as stickers. Charging the printer takes roughly 90 minutes, and the battery has a claimed printing capacity of roughly 100 prints per charge. We could not test this since we did not have 100 films, but the battery indicator still had two out of three bars in the app, after printing 20 photos. The Fujifilm Instax Share SP-2 instant printer is priced at Rs. 13,499, which is a lot more than what you'd pay for an instant film camera, and a bit more than HP's Sprocket instant printer. You'll also be paying quite a bit for the film. A 10-pack cartridge costs around Rs. 550, which comes to about Rs. 55 per print. ZINK paper is generally available for roughly half the price, so it's a bit more economical. If you specifically want Polaroid-style photos and you need better image quality than what you get with instant film cameras, the Instax Share SP-2 is a good investment. It's a bit bulky and looks bland, but it prints photos very quickly. The companion app is easy to use and offers useful features. product Fujifilm Instax Share SP-2 lets you print photos from your smartphone onto instant film in just 10 seconds. We review to find out if it’s worth a buy.